FOR THE $850 FOR 2 HOURS then $110 per hour after that. 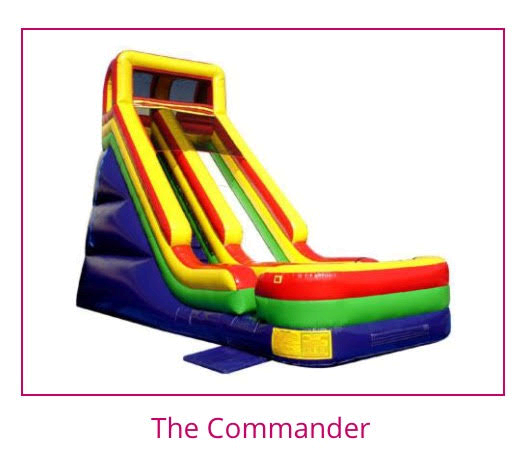 YOU HAVE A PERSON FROM JUMPABOUT STAY THERE WITH IT FOR THE HIRE TIME The impressive commander slide is a dry slide guaranteed to add tons of excitement and acceleration to any indoor or outdoor event. Great for promoting friendly competition or group challenges, for a fast-track ride to the cushioned bottom with a safety stop. Hooded safety on top makes sure riders slide down properly. The bright and colourful theme fits into any décor, sure to attract customers for a thrill-filling day, and keep the kids sliding!